The Albion Cup National Soccer Showcase Games extended into Monday, July 20th and offered the top play of the entire showcase. In the Men’s U19 division, host team Albion narrowly defeated United Futbol Black in an intense meeting on Monday. The story was much of the same for the Women’s U19 as Albion White defeated the San Diego Surf White, 2-1. In the Boys U14 Puma V Elite, San Diego Surf Academy took top honors over Palos Verdes. Albion Cup – Boys U15 PUMA VElite – Championship Game – 2009 from Sports Force on Vimeo. Albion SC defeated the Fram CQ Vipers in the U15 Puma V Elite division, though both teams secured a trip to the USA Cup next year. For the girls Puma V Elite finals on Monday, Albion defeated PQ Premiere 1-0 in the U14 division. Close games were omnipresent in the finals and the U15 Girls were no exception as the SoCal Blues Draluck defeated Arsenal FC to take the finals. With our website launch rapidly approaching, days off for the SportsForce team come few and far between. We took exception this past week for opening day at the horse races in Del Mar. With our office conveniently located very close to the track, we decided to take a half day for this Southern California tradition that has been going on for 70 years. The SportsForce team is working hard behind the scenes making sure our site will be the best experience for you when it launches. We are testing everything, making sure everything is in the right place, and most importantly, that it works! SportsForce was at the So Cal Cup this past weekend. The event features Southern California’s Top Baseball Prospects. Director, Mike Viera, with San Gabriel Valley Baseball gave SportsForce open access to the event. SportsForce also had the pleasure of interviewing Mike as part of the event to learn more about some of the top players in the event and what colleges were there. This past weekend, top soccer players from around the world from ages 8 to 14 met at the San Diego Polo Fields in Del Mar to compete in the 2009 Surf Cup. As one of the top tournaments in the country, this year’s Surf Cup selected teams from all over the country to come play. These teams included the Concord Fire of Georgia, Eastside FC out of Washington, and the Texas Fire traveling in from Texas. Not only did the Surf Cup attract top teams from all of the US, but it also hosted teams from around the world including the Universidad Pumas of Mexico and the Calgary Blizzards from Canada. Despite the stiff national and international competition, Southern California teams had quite the impressive showing, winning every single division except one. The Dallas Texans proved to be too much for the San Diego Surf Blue in the Girls U12 division, taking the final 2-0. For a complete list of the winners by division, click here. Complete coverage of the weekend’s event can be found by visiting San Diego’s “go-to” site for local soccer news, XKSanDiego.com. Complete with pictures of the event, recaps of each division, action shots of most of the players, and more, XKSanDiego.com is your one stop shop for San Diego soccer news. With youth division play out of the way, another wave of all-star soccer players are set to come to the valley this weekend. Starting this Saturday, the U16-U19 divisions will feature top talent from around the world. The incredible level of competition is guaranteed to draw top coaches from all over the country who will look to both further their relationships with players they’ve already been recruiting and to start relationships with the up and coming prospects. Be sure to check back next week for a recap of the action. This year’s Albion Cup National Soccer Showcase had a special incentive for U15 Boys competing in the Puma V Elite Division: a chance to go to the USA Cup. The two finalists at the Albion Cup Showcase will travel to the 2010 USA Cup® in July to compete in the U16 Boys V-Elite bracket in Minneapolis. The top two teams from this year’s showcase were Albion SC and Fram CQ Vipers. The winner of the Cup will fly to London in August 2010. They will train at one of the world’s most elite facilities, play a match against the Tottenham Hotspur Academy Team, and get tickets to a first team match at historic White Hart Lane. Congratulations to Albion SC and Fram CQ Vipers! The Albion Cup National Soccer Showcase is an annual three-day event held throughout San Diego. The event is for club teams in divisions U8-U19 for both boys and girls. The Showcase offers a chance to face top competition, gain visibility from college coaches and compete in a quality tournament sponsored by Puma. This year’s tournament offered an amazing depth of talent from California as well as many teams from around the country. Many games were fought hard under the sun in an exceptionally hot weekend. There were several stellar performances on different levels, but Albion, the namesake team took top honors in several different levels and established their dominance in the final day of the tournament. Laguna Hills Eclipse also came out on top in multiple divisions. ALBION CUP 2009 – Soccer Highlight Video from Sports Force on Vimeo. The tournament offers both Showcase and Cup brackets for each age group with Showcase featuring elite teams. Puma also sponsored a special elite bracket, the Puma V Elite, for both Boys and Girls in the U14 and U15 divisions. The Boys in the U15 division were also competing for a chance to play in Tottenham, England at the USA Cup in 2010. In order to get the word out about SportsForce and engage athletes, coaches and sports parents in person, SportsForce has put together a group of talented college students who are former competitive athletes and passionate sports enthusiasts to act as the SportsForce street team. The street team was an integral part in the planning and execution of our partnership with the Albion Cup Soccer Showcase and will be helping with upcoming events and our grassroots awareness campaigns. SportsForce spent the last half of the week all over San Diego filming games for the Albion Cup National Soccer Showcase. The Albion Cup National Soccer Showcase was open for teams to play in either the Top Showcase Group or the Cup Group for Boys and Girls U8-U19. The event is an important soccer showcase for athletes looking to showcase their abilities to college coaches in attendance. Here’s a list of some of the college coaches in attendance: http://www.albioncup.org/CC/index_E.html. Spread out of over several different top quality venues, the SportsForce team spent their days and evening at UCSD, Robb Field, and Hickman Field soccer fields just to name a few. Teams ranged from the U8 – U19 age groups for both girls and boys. The Showcase was an amazing opportunity for the athletes who attended and there was quality play for the entire three-day event. Puma, the event sponsor, put on a special Puma V Elite Bracket for U14 and U15 teams, and also a chance for the Boys U15 team to advance to play in London. SD United Futbol Black took the top honors for the U17 Girls Showcase, while Laguna Hills Eclipse Blue took the title for the Cup in the same age bracket. For the U19 Women’s group, the host team, Albion SC White won the Showcase title, and the Laguna Hills Eclipse took the Cup in the U19 Women’s as well. As for the upper age groups for the Boys teams, FC San Diego Gold, coached by top coach and former professional player Brian Quinn won the Showcase for the U17 Boys, while Legends FC Black took top honors for the cup division. The host team once again took Showcase honors for the Men’s U19 with Albion SC winning, while PQ Premier won the U19 Cup division. Dennis Wyrick a former Arizona State baseball teammate with Andrew Beinbrink visited the SportsForce office to catch up and talk sports. Dennis was a two-sport star in high school, and went on to play Division I baseball in college and was a 35th round draft pick in 1999, and a 23rd round pick by the Orioles in 2003. Dennis hung around to learn about the benefits that SportsForce is offering athletes, sports parents and coaches. Dennis talked about plans for the Orange County and Los Angeles areas and expanding SportsForce’s presence there. Dennis knows the world of sports as an athlete, and also as a coach as he is currently coaching football for the Orange Country Patriots Junior Midget team in his spare time. Some great thoughts from Adrian Gonzalez, Torii Hunter, Jared Weaver and more courtesy of Adrian Garcia. I believe “the dream” for any athlete, started the minute he or she watched a game on tv, or was at a venue, seeing pro athletes for the first time, aware of what was happening. For me, I can point to three incidents. 1982, I was only in 2nd grade, but I remember watching Paolo Rossi lead Italy to the World Cup title in Spain. I remember the crowd chanting and the Televisa announcer’s high octane call of the action. The majesty of the Copa Mundial got me so hooked on soccer, I got the rest of the kids in my section of the Imperial Manor apartments in south San Diego (right between Sidro and IB) into soccer. We played “metegol” (shootouts) everyday, wearing the low budget goalie gloves (they were gold to me) that my pops bought me at La Popular sports shop in TJ. 1983, Russ Hall (Dude was awesome, he went out of his way to make a bunch of us little Mexican kids love sports) our coach from the South Bay Rec Center league, took our flag football team to watch the Chargers and Rams scrimmage in Training Camp. The moment I saw Dan Fouts thread one into Kellen Winslow’s hands across the middle, I knew I wanted to be a QB (that thought was cemented after watching a young buck named John Elway with a rifle that left crosses on receiver’s chests). Of course 1984, the Padres went to their first World Series, and I remember eating a Padres Pack from McDonalds, watching the man who would become my hero, Tony Gwynn, use that sweet cut as he went “oppo”. Padres became Cub-busters and everyone wanted that t-shirt. By the way, former Dodger Steve Garvey may have been getting more attention, but TG19 was the one batting .350. On July 12, at Poway High School SportsForce was on hand to capture footage from the San Diego High School Baseball Showcase. The event was put on by the San Diego County Baseball Coaches Association and featured many of the best seniors throughout the county. In attendance were college coaches (including USD, LMU, University of Oklahoma and Long Beach State) and MLB scouts. The event was a great opportunity for the athletes to showcase their many skills with the hopes of reaching the next level. The event consisted of four teams: South County, North County, East County, and a San Diego City team. During the morning, the North and South teams both ran the “60” (60 yard sprint) with scouts and coaches eagerly timing each player. After, both teams proceeded to take a 30 minute batting practice session, followed by a ten minute infield/outfield. The teams then played a nine inning game with slightly different rules. Each ½ inning consisted of a new pitcher facing a maximum of five batters, with the bases being cleared after three outs. During the afternoon, the same process was repeated by the East and City teams. There were many impressive players throughout the day, but there were a few from each team who really stood out. Agustin Lopez from Montgomery got the game started off on the right foot by blasting a home run to left field in the 1st inning. Lopez, a 6’1” RHP / 1B, also pitched a scoreless inning on the mound. He is coming off a very strong year on the mound where he had a 1.91 ERA and held opponents to a .189 BA. Hector Montes, an infielder from Bonita Vista, put on a very impressive power display during batting practice, belting numerous homers to left and center field. At 235 lbs, he was surprisingly fast, running his 60 in 7.47 seconds. Montes was dominant during his high school season batting .429 and hitting 7 home runs. Robert Lucero, a 6’1” outfielder from Chula Vista, displayed impressive power by hitting a home run during the game. He ran his 60 in 6.78 seconds which is above average speed for an outfielder. With summer tournaments, showcases and camps happening nearly everyday of the week in California, SportsForce has been all over the place getting footage and meeting with coaches, athletes, parents and teams. SportsForce was meeting with coaches and filming at the 19th Annual Alex Spanos All-Star Football Classic where some of San Diego’s best graduating senior football players are showcased before heading off to play college football. Many of the players at the showcase have signed with college programs including SportsForce alum, La Jolla’s Robbie Beathard who will be playing at the University of San Diego. Jerik Davis of Mira Mesa who will be playing at New Mexico State and Robbie Rouse of Madison High School who is signed with Fresno State. The San Diego Showcase sponsored by the San Diego County Baseball Coaches Association was held July 12 at Poway High School. The event showcased top baseball players from around the county who are entering their senior year. Over 20 college coaches (including USD, Long Beach State, Univ. of Oklahoma, LMU and more) and MLB scouts were at the event while SportsForce filmed the entire pro-style workout and games. SportsForce was able to see top softball players at the Champions Cup Softball 16U Tournament in Irvine, CA this weekend as well. Over 50 college coaches attended the event, which was the first of a two-weekend tournament. The 18U Tournament will be held next weekend. The Showcase is an amazing opportunity for the athletes and teams that attend and Puma is helping to make one level even more competitive. Puma is putting on a special Puma V Elite Bracket for U14 and U15 teams, including special invitations sent out to Puma clubs from around the country. Noah Gins, Technical Director/ Director of Coaching for the Albion Peninsula Soccer league commented on the company’s involvement. “They’ve brought all the bells and whistles for this including banners, retail stores and tents, and a lounge for kids to hang out in. We had (former women’s national team player) Leslie Osborne here last year,” he said. “We’re at a point now where we want the best teams in the country and that’s what we’re after.” Follow up with us next week for a full recap of the Albion Cup National Soccer Showcase. SportsForce has added a new member to our Street Team, Katherine Salter. Katherine was a former high school volleyball player that was recruited by smaller schools to play college volleyball. Katherine is assisting with our grassroots efforts for Girls and Boys Volleyball. SportsForce partner Dan Plashke’s son Jackie and his little league team won their district this past weekend. 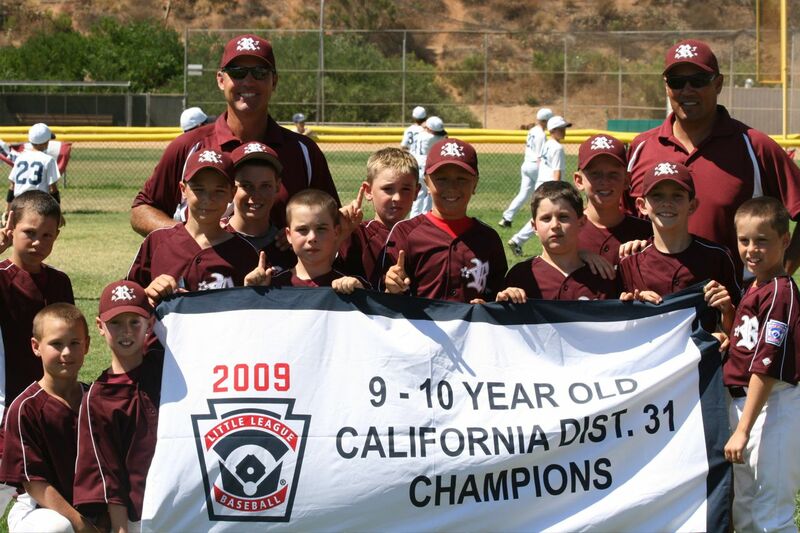 The team is now the 9-10 year old District 31 Champions are moving on hoping to win the divisional title this coming weekend. We wish them the best of luck! The SportsForce team also met with our web development group, Barefoot Solutions (www.barefootsolutions.com) to discuss the homestretch towards launching the new site. We have a lot of video and content to add to the site as well as some changes to make to ensure the best experience when we launch (hopefully) in early August. Last week, SportsForce partnered with the College Baseball Exposure Camp in San Diego, CA. Players from around the country competed before a panel of distinguished NCAA coaches from colleges including Stanford, USC, Hawaii, UC Irvine, UNLV, and Cal State Dominguez Hills. Head coaches from established Division I programs Gonzaga, Santa Clara, and UC Berkeley were also in attendance. They spent time evaluating and coaching players on the drills and skills taught at the college level. SportsForce was there to film all the action and prepare a video package for each player. Day one began with a comprehensive assessment and training regime. Players were separated into their positions and given one on one instruction on advanced college level techniques. Instruction covered every element of the game from hitting to basic fielding techniques. Fundamentals were the main focus of the morning, emphasized by Coach Barbara (University of the Pacific), Coach Nakama (Stanford), and Head Coach O’Brien (Santa Clara). Simple lessons, from these coaches, like staying low and catching groundballs out in front, can prove vital to a young player’s development and the opportunity was not taken lightly. Top prospects Sheldon Gabriels (Sophomore) and Wesley Wallace (Senior) showed off their defensive prowess and strong arms during the shortstop evaluations.